Fixed Times for Various Occasions. In order to fix the beginning and ending of the Sabbath-day and festivals and to determine the precise hour for certain religious observances it becomes necessary to know the exact times of the rising and the setting of the sun. According to the strict interpretation of the Mosaic law, every day begins with sunrise and ends with sunset (Ibn Ezra, commentary on Ex. xviii. 14). This confirms the opinion of R. Jose that twilight is like the twinkling of the eye, that is to say, with sunset day immediately changes to night (Shab. 35a). The Hebrew term "'alot ha-shaḥar" (the rising of the morning) denotes the period immediately before sunrise (comp. Gen. xix. 15, 23). "'Af'appe shaḥar" (the brows of the morning) is the poetic expression for the "dawning of the day," (Job iii. 9). The morning star is called "barkai" (Yoma iii. 1) and "ayyelet ha-shaḥar" (Yer. Ber. i. 1). "Neshef" (Isa. xxi. 4) denotes either dawn or twilight (Ber. 3b). "Boḳer" is the beginning of the day; and "'ereb" is the beginning of the night. "Ben ha-'arbayim" (Ex. xii. 6) is interpreted by the Rabbis as meaning the late afternoon, when the sun declines to its setting, while "ben ha-shemashot" (between the suns; i.e., between the setting of the sun and the rising of the moon or the appearance of the stars) denotes the evening twilight. The Rabbis consider it doubtful whether twilight belongs to the day or to the night (Shab. 34b); consequently they treat it as a safeguard against encroachment upon either—for example, the twilight of Friday is reckoned as Sabbath eve, and that of Saturday as Sabbath day; and the same rule applies to festival days. This practise is termed "adding from the secular to the holy." 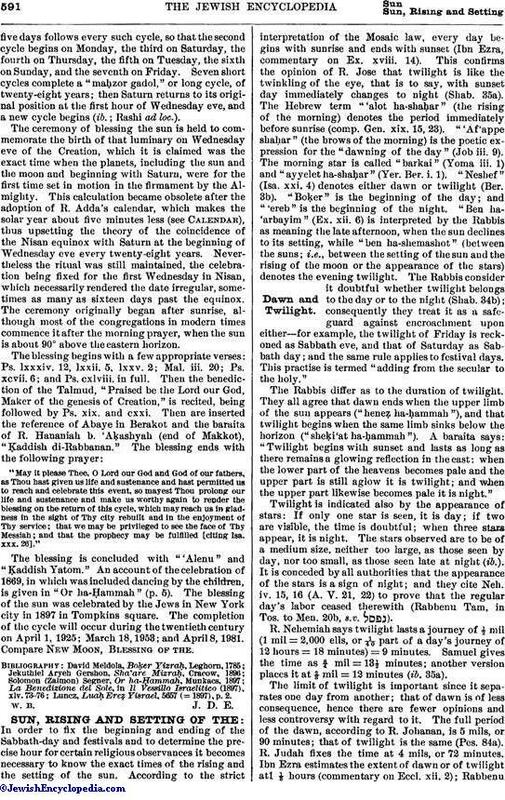 The Rabbis differ as to the duration of twilight. They all agree that dawn ends when the upper limb of the sun appears ("heneẓ ha-ḥammah"), and that twilight begins when the same limb sinks below the horizon ("sheḳi'at ha-ḥammah"). A baraita says: "Twilight begins with sunset and lasts as long as there remains a glowing reflection in the east: when the lower part of the heavens becomes pale and the upper part is still aglow it is twilight; and when the upper part likewise becomes pale it is night." Twilight is indicated also by the appearance of stars: If only one star is seen, it is day; if two are visible, the time is doubtful; when three stars appear, it is night. The stars observed are to be of a medium size, neither too large, as those seen by day, nor too small, as those seen late at night (ib.). It is conceded by all authorities that the appearance of the stars is a sign of night; and they cite Neh. iv. 15, 16 (A. V. 21, 22) to prove that the regular day's labor ceased therewith (Rabbenu Tam, in Tos. to Men. 20b, s.v. ). R. Nehemiah says twilight lasts a journey of ½ mil (1 mil = 2,000 ells, or 1/40 part of a day's journey of 12 hours = 18 minutes) = 9 minutes. Samuel gives the time as ¾ mil = 13½ minutes; another version places it at ⅔ mil = 12 minutes (ib. 35a). The limit of twilight is important since it separates one day from another; that of dawn is of less consequence, hence there are fewer opinions and less controversy with regard to it. The full period of the dawn, according to R. Johanan, is 5 mils, or 90 minutes; that of twilight is the same (Pes. 84a). R. Judah fixes the time at 4 mils, or 72 minutes. Ibn Ezra estimates the extent of dawn or of twilight at1 ⅓ hours (commentary on Eccl. xii. 2); RabbenuTam, at 3¼ mils, or 58½ minutes. 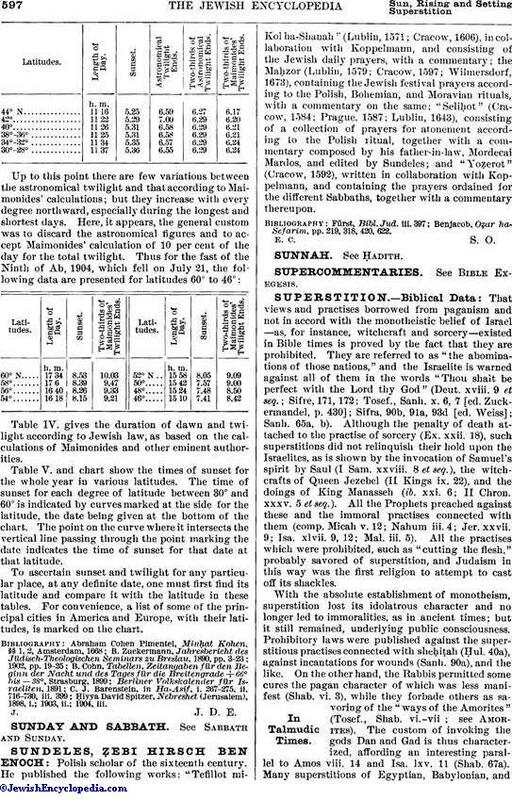 Maimonides says dawn lasts 1⅕ periodical hours (see Table IV.) as the reflection of the sun strikes the atmosphere, which is 51½ mils above the earth (= 103,000 ells, or 68,667 yds.). The divergent calculations of the length of dawn and twilight are accounted for by the difference in the latitude in which the Rabbis made their observations and by the difference in regard to the use of terms. The period of ¾ of a mil, or 13½ minutes, is calculated for Jerusalem (lat. 32° N.), and is evidently that of the first part of twilight, which is considered as being part of the day. At the end of 13½ minutes after sunset the sun would be about 3½° below the horizon, when the afterglow illuminates the eastern regions of the sky; the glow in the zenith lasts till the sun reaches 6½° below the horizon (= 26 minutes), when the stars become visible and night sets in. The stars appear in the latitude of Jerusalem about 22 minutes after sunset in winter, and about 28 minutes in summer, while there still is seen the reflection of the sun's rays traversing the earth's atmosphere above the spectator's horizon, which lasts till the sun has disappeared 18° below the horizon (= 72 minutes). This is known as the astronomical twilight, which increases with the inclination of the sun's obliquity toward the poles (comp. Table III.). The full duration of the astronomical twilight is not considered in Jewish law, especially in the northern regions, where, beyond lat. 50°, between June 9 and July 9, and beyond 60°, between April 20 and Aug. 18, dawn and twilight overlap each other. The highest Jewish authorities, including Maimonides, estimate the full extent of dawn and twilight at 1⅕ "sha'ot zemanniyyot," or periodical hours, whose length is equal to one-twelfth of either the day or the night, whichever is the longer. Thus if the day and the night each equal 12 hours of 60 minutes each, the 1⅕ periodical hours would contain 72 minutes; but when the day is 13 hours long every periodical hour contains 65 minutes, and the 1⅕ hours are increased proportionately (see Table IV.). This calculation corresponds almost exactly with that of the astronomical twilight in latitudes near the equator; but with every degree northward the duration of the twilight increases till it is double in latitude 60°. Even Maimonides' shorter twilight of 1⅕ periodical hours has to be divided at that latitude, one part belonging to the day, and the other part to the night. Or, as a precaution against possible error, the 1⅕ periodical hours may be divided into three parts: (1) day, (2) doubtful, and (3) night. R. Moses Alashḳar in his responsa (No. 96) gives a rough estimate of 40 minutes as the time which elapses "from the setting of the upper limb of the sun to the appearance of stars," which corresponds with the average twilight of Maimonides at latitude 36°. Calculations of the rising and the setting of the sun are based on the appearance and disappearance respectively of its upper limb, and are made according to the European solar time. Standard or railroad time gives an arbitrary division by single hours drawn on irregular lines for the convenience of business; hence it becomes necessary either to add to or to subtract from that time to obtain a correspondence with solar time. 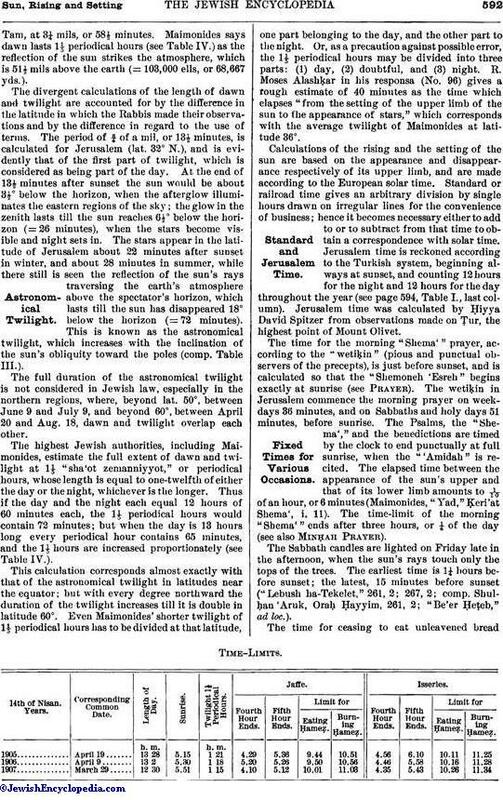 Jerusalem time is reckoned according to the Turkish system, beginning always at sunset, and counting 12 hours for the night and 12 hours for the day throughout the year (see page 594, Table I., last column). Jerusalem time was calculated by Ḥiyya David Spitzer from observations made on Ṭur, the highest point of Mount Olivet. The time for the morning "Shema'" prayer, according to the "wetiḳin" (pious and punctual observers of the precepts), is just before sunset, and is calculated so that the "Shemoneh 'Esreh" begins exactly at sunrise (see Prayer). The wetiḳin in Jerusalem commence the morning prayer on week-days 36 minutes, and on Sabbaths and holy days 51 minutes, before sunrise. The Psalms, the "Shema'," and the benedictions are timed by the clock to end punctually at full sunrise, when the "'Amidah" is recited. The elapsed time between the appearance of the sun's upper and that of its lower limb amounts to 1/10 of an hour, or 6 minutes (Maimonides, "Yad," Ḳeri'at "Shema', i. 11). The time-limit of the morning "Shema'" ends after three hours, or ¼ of the day (see also Minḥah Prayer). The Sabbath candles are lighted on Friday late in the afternoon, when the sun's rays touch only the tops of the trees. The earliest time is 1¼ hours before sunset; the latest, 15 minutes before sunset ("Lebush ha-Tekelet," 261, 2; 267, 2; comp. Shulḥan 'Aruk, Oraḥ Ḥayyim, 261, 2; "Be'er Ḥeṭeb," ad loc.). Twilight 1 ⅕ Periodical Hours. L. 44° N. (For Maine, Nova Scotia Northern New York, Michigan, Wisconsin, Minnesota, North and South Dakota, Montana, Washington Northern Oregon, Northern Idaho.) Portland, Me. L. 42° (For Massachusetts. New Hampshire, Vermont, Central New York, Southern Michigan, Wisconsin, Northern Iowa, Wyoming, Southern Idaho, Southern Oregon.) Boston, Mass. L. 40° (For Southern New York, Connecticut, Rhode Island, Pennsylvania, New Jersey, Northern Ohio, Indiana and Illinois, Southern Iowa, Nebraska, Northern Colorado, Utah, Nevada, California.) New York City. Chicago, Ill.
L. 38°-36°. (For District of Columbia, Delaware, Maryland, Virginia, West Virginia, Southern Ohio, Southern Indiana, Southern Illinois, Northern Missouri, Kansas, Central Colorado, Central Utah, Central Nebraska, Central California.) Washington, D. C. Norfolk, Va.
L. 34°-32°. (For South Carolina, Northern Georgia, Alabama, Mississippi, Louisiana, Texas, Southern New Mexico, Arizona, and California.) Savannah, Ga. Charleston, S. C.
L. 30°-28°. (For Florida, Southern Georgia, Alabama, Mississippi, Louisiana, and Texas.) Pensacola, Fla. New Orleans, La. h. m. h. m. h. m. h. m. h. m. h. m. h. m.
L. 60° N. St. Petersburg, Russia. L. 58°. Scotland; Government of Novgorod, Russia. L. 56°. Government of Moscow; Nijni-Novgorod, Russia. L. 54°. Ireland; North Germany; Governments of Wilna, Grodno, Minsk, Moghilef. L. 52°. Holland; Governments of Warsaw and Orenburg, Russia. L. 50°. England; Governments of Jitomir, Kiev, Poltava, and Kharkov, Russia. L. 48°. South Germany; Governments of Yekaterinoslav and Kamenetz-Podolsk, Russia. L. 46°. Austria; Governments of Odessa and Kherson, Russia. 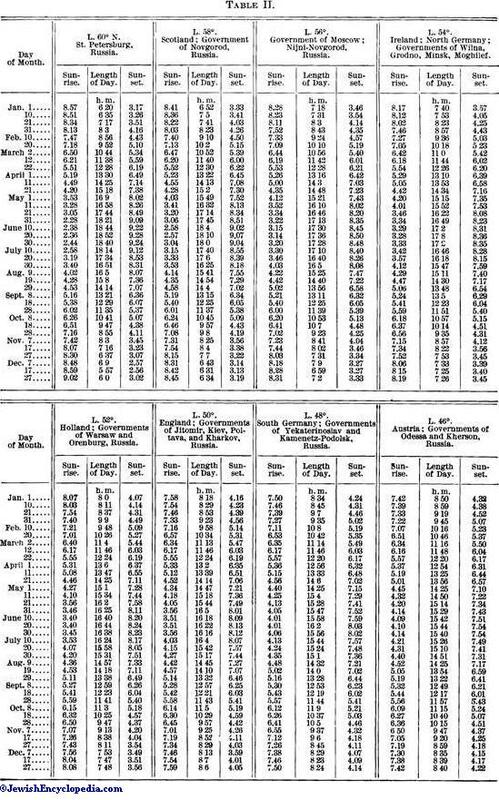 h. m. h. m. h. m. h. m. h. m. h. m. h. m. h. m.
Table III.—Duration of Dawn and Twilight According to Astronomical Calculation. Northern and Southern Latitudes Compared. h. m. h. m. h. m. h. m. h. m. h. m.
Jan. 1 1 27 1 39 1 48 2 1 2 20 2 48 Dec. 16. 11 1 26 1 38 1 47 1 59 2 17 2 44 6. 31 1 23 1 34 1 43 1 54 2 9 2 30 16. Feb. 10 1 22 1 33 1 41 1 53 2 7 2 27 6. 20 1 22 1 32 1 40 1 51 2 5 2 24 Oct. 27. March 1 1 21 1 31 1 39 1 49 2 3 2 21 17. 11 1 21 1 31 1 40 1 50 2 6 2 24 7. 21 1 21 1 33 1 41 1 52 2 13 2 31 Sept. 27. 31 1 22 1 34 1 43 1 55 2 15 2 41 17. April 10 1 24 1 36 1 47 2 0 2 30 3 10 7. 20 1 26 1 40 1 53 2 9 3 0 .. .. Aug. 28. 30 1 28 1 45 2 0 2 21 .. .. .. .. 18. May 10 1 31 1 51 2 6 2 33 .. .. .. .. 8. 20 1 34 1 56 2 14 2 40 .. .. .. .. July 29. 30 1 36 2 0 2 25 3 45 .. .. .. .. 19. June 9 1 37 2 4 2 35 .. .. .. .. .. .. 9. 19 1 38 2 4 2 34 .. .. .. .. .. .. June 29. 29 1 38 2 4 2 34 .. .. .. .. .. .. 19. July 9 1 36 2 1 2 26 .. .. .. .. .. .. June 9. 19 1 33 1 55 2 15 3 40 .. .. .. .. May 30. 29 1 32 1 51 2 9 2 41 .. .. .. .. 20. Aug. 8 1 29 1 46 2 3 2 24 .. .. .. .. 10. 18 1 26 1 42 1 55 2 14 3 5 .. .. April 30. 28 1 24 1 38 1 49 2 4 2 27 3 12 20. Sept. 7 1 23 1 35 1 46 1 58 2 17 2 50 10. 17 1 22 1 33 1 43 1 53 2 10 2 30 March 31. 27 1 21 1 32 1 40 1 50 2 5 2 25 21. Oct. 7 1 21 1 31 1 39 1 49 2 3 2 23 11. 17 1 21 1 32 1 40 1 50 2 4 2 22 1. 27 1 22 1 33 1 40 1 51 2 5 2 24 Feb. 20. Nov. 6 1 23 1 34 1 42 1 54 2 8 2 28 10. 16 1 25 1 36 1 44 1 56 2 11 2 36 Jan. 31. 26 1 26 1 37 1 46 1 58 2 15 2 40 21. Dec. 6 1 27 1 38 1 47 1 59 2 17 2 43 11. 16 1 27 1 39 1 48 2 0 2 19 2 46 1. 26 1 27 1 39 1 49 2 1 2 20 2 49 Dec. 26. 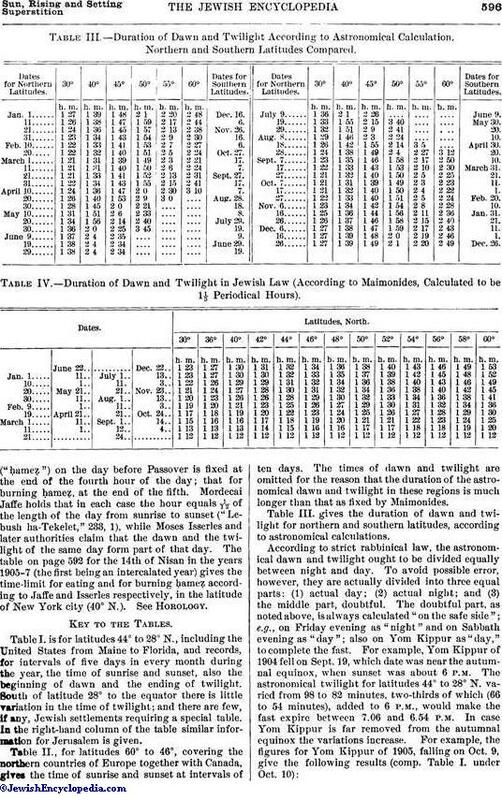 Table IV.—Duration of Dawn and Twilight in Jewish Law (According to Maimonides, Calculated to be 1⅕ Periodical Hours). h. m. h. m. h. m. h. m. h. m. h. m. h. m. h. m. h. m. h. m. h. m. h. m. h. m.
The time for ceasing to eat unleavened bread ("ḥameẓ") on the day before Passover is fixed at the end of the fourth hour of the day; that for burning ḥameẓ, at the end of the fifth. Mordecai Jaffe holds that in each case the hour equals 1/12 of the length of the day from sunrise to sunset ("Lebush ha-Tekelet," 233, 1), while Moses Isserles and later authorities claim that the dawn and the twilight of the same day form part of that day. 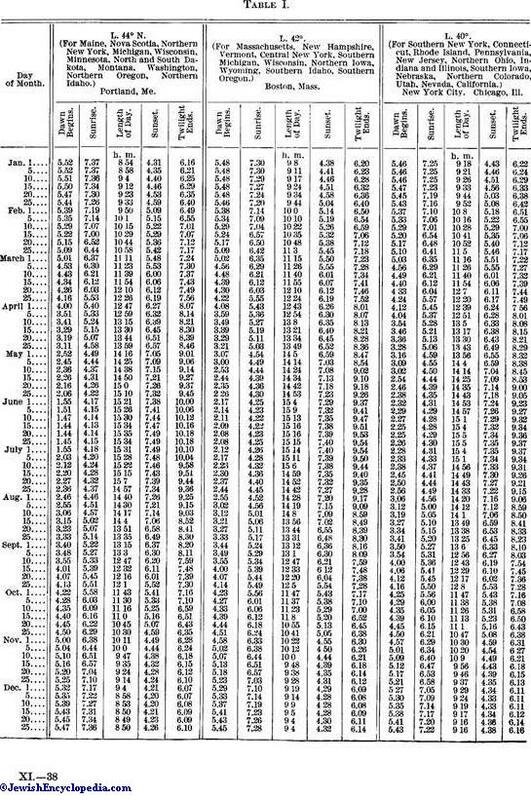 The table on page 592 for the 14th of Nisan in the years 1905-7 (the first being an intercalated year) gives the time-limit for eating and for burning ḥameẓ according to Jaffe and Isserles respectively, in the latitude of New York city (40° N.). See Horology. Table I. is for latitudes 44° to 28° N., including the United States from Maine to Florida, and records, for intervals of five days in every month during the year, the time of sunrise and sunset, also the beginning of dawn and the ending of twilight. South of latitude 28° to the equator there is little variation in the time of twilight; and there are few, if any, Jewish settlements requiring a special table. In the right-hand column of the table similar information for Jerusalem is given. Table II., for latitudes 60° to 46°, covering the northern countries of Europe together with Canada, gives the time of sunrise and sunset at intervals of ten days. The times of dawn and twilight are omitted for the reason that the duration of the astronomical dawn and twilight in these regions is much longer than that as fixed by Maimonides. Table IV. gives the duration of dawn and twilight according to Jewish law, as based on the calculations of Maimonides and other eminent authorities. 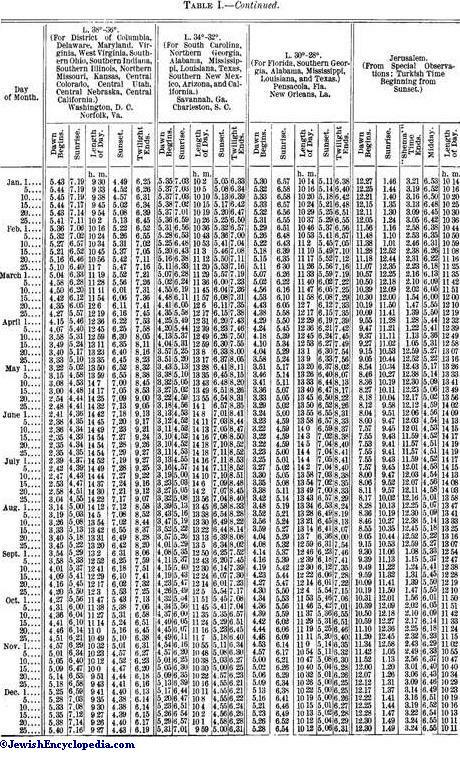 Table V. and chart show the times of sunset for the whole year in various latitudes. The time of sunset for each degree of latitude between 30° and 60° is indicated by curves marked at the side for the latitude, the date being given at the bottom of the chart. The point on the curve where it intersects the vertical line passing through the point marking the date indicates the time of sunset for that date at that latitude.To ascertain sunset and twilight for any particular place, at any definite date, one must first find its latitude and compare it with the latitude in these tables. For convenience, a list of some of the principal cities in America and Europe, with their latitudes, is marked on the chart. Ḥiyya David Spitzer, Nebreshet (Jerusalem), 1898, i.; 1903, ii. ; 1904, iii.